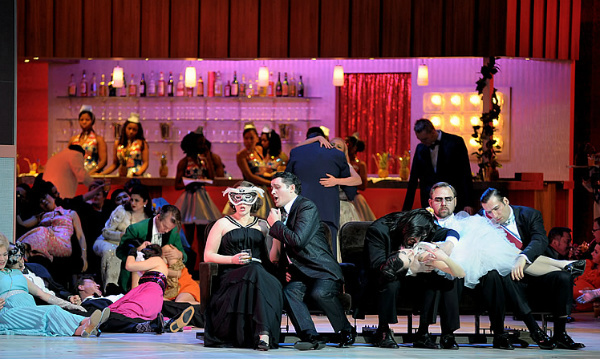 Need a quick refresher about Verdi's A Masked Ball (Un ballo in maschera) before you attend your performance? Look no further! Here are the top ten things you need to know about this opera, and our production. It was the first and only time in Verdi’s career that he adapted an already existing libretto, Gustave III, ou Le bal masqué by Eugène Scribe. Scribe’s libretto had been set to music by French composer Daniel Auber in 1833 and enjoyed great success at its premiere in Paris. The story is worthy of a modern TV drama series. A very human tale of political intrigue and forbidden love, A Masked Ball was inspired by the real-life assassination of Sweden’s King Gustav III. King Gustavo is in love with his best friend’s wife, Amelia, and she is in love with him. Their clandestine attraction is discovered by her husband who vows to take revenge at a masked ball. Born out of Verdi’s fertile middle-period, many opera lovers would say that this is one of Verdi’s best pieces. The production stands or falls by its singers, and all five major roles give the best in opera the chance to showcase their immense talents. The powerful story also lends to the magnificent score, and the contemporary story of a mature (but ultimately doomed) love story, still resonates with audiences.